The term “employee advocacy” is thrown around quite a bit when it comes to online marketing strategies. But it’s not always clear what exactly that means—let alone how to get an initiative like that off the ground. At Sociabble, we understand these questions, and we have the answers. In fact, we’ve worked with companies in over 80 countries all over the world to launch effective employee advocacy and employee communication programs, including brands like Microsoft, BNP Paribas, Groupe Renault, and L’Oreal. Because we know how much uncertainty exists when it comes to the term, we thought it might prove helpful to create a concise employee advocacy guide. Below, you can learn more about the importance of employee advocacy, as well as how to plan and launch a program of your own. 1. 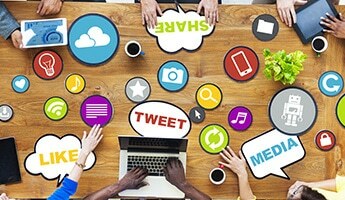 What is Employee Advocacy? It’s no secret that employees are the most crucial resource at any given company. But what is often overlooked is that they can also be a brand’s most powerful ambassadors. Simply by using their own enthusiasm and influence to spread awareness across their social networks. “Employee advocacy” has been a hot topic as of late, and with good reason—it’s seen as an essential part of any marketing platform in the digital era. But what is it, exactly? What is the employee advocacy definition? Essentially, employee advocacy is what happens when employees use their own social networks or other information channels to promote their company. By sharing content, liking updates, and even creating company-related content of their own, they spread positive brand awareness and become online ambassadors of the brand. Because this word-of-mouth publicity is more authentic and organic, potential consumers tend to trust it more. After all, wouldn’t you trust a friend’s recommendation far more than an advertisement you saw online? And then there’s also the question of reach. The nature of social media means that even a relatively small number of online supporters can result in a tremendous amount of reach. And if you get a substantial percentage of your workforce on board, the possibilities are endless. For example: if your company has 100 employee advocates with a social network of 500 people, with just 10 shares a month, you’ve already created 500,000 touchpoints. That potential for reach is why employee advocacy can be so effective, even if you start out relatively small. A little employee advocacy can go a long way. We’ve covered the employee advocacy definition, but the question remains, why does is matter? Well, as Jules Schroeder explains in Forbes, “the content you share represents who you are and what you stand for – it is your digital footprint.” The advantage of an employee advocacy program is that it allows you to combine the aggregation of brand, third-party, and employee-generated content with the provision of dedicated training. Ultimately helping your employees to position themselves effectively on social media. Why does this matter? Because today, most consumers trust their online peers more than brands. And as stated by a recent article published in the Harvard Business Review, a key component of brand credibility is employee advocacy. One study found that only 19% of employees feel that their work experience is matched by how their companies promote themselves publicly. And only 12% of employees put a lot of trust in what companies say about themselves. Those are hard numbers to go up against. The best way to build trust in this landscape, though, is by letting your own employees speak for themselves. To use their own voices to create a positive impression as thought leaders. Why Engage in Thought Leadership Activity? Developing a professional presence on social media is a mark of confidence, as well as a sign of someone whose work is enjoyable and engaging. It’s also a great way of interacting with new and existing professional connections who may provide gateways to new opportunities. Furthermore, thought leadership applies to all industries. It can be a software developer sharing a report on big data, or an architect blogging about ambitious projects. It’s truly universal. Sharing interesting content, making insightful contributions to online discussions, and forming opinions on relevant subjects are central to thought leadership. What’s stopping many individuals from doing so is limited access to relevant content. Or they are not actively encouraged to do so by their employer. In many cases, both are true. An employee advocacy platform provides the ideal environment in which to foster thought leadership activity among employees. An employee advocacy platform gives individuals access to company news, which they can share on their own social network accounts. By centralizing all brand content on a single platform, companies make it easy for employees to access the latest news and great workplace stories. As well as sharing content that showcases their own work, such as an event they helped organize, employees can stay up to date with and engage with all workplace activity. Simply by sharing the announcement of a new client in another country, for example, or communicating about fellow teams’ achievements. It can start with something as basic as that. In the same way that sharing company news is just one element of effective thought leadership, this is just one aspect of an employee advocacy program. An employee advocacy platform also allows companies to pull in relevant third-party content from across the web. Content can be industry-specific (for example, an energy company might curate content for sustainability), but can also tie in with causes that are important to the organization. For example, philanthropy, CSR and leadership development. Prioritizing third-party content alongside company stories makes it easy for employees to share industry insights and establish a positioning with regard to key issues. Finally, an employee advocacy program enables employees to develop thought leadership by becoming content creators. Users can submit posts they find on the web or write something from scratch. Content creation is a great way to highlight employees’ personal insights and encourage company teams to engage. Writing brand new content isn’t for everyone, and often comes more naturally to marketing departments or senior management. However, on an employee advocacy platform, it can be open to everyone while employees also have the opportunity to contribute in other ways. By importing and commenting on content that exists elsewhere on the web, for example. Thanks to the internet and social media, the way we receive, process, and share information has changed drastically. This may seem like a high-tech adaptation, but in some ways it’s actually more like the way news and gossip was once spread through towns and villages by word of mouth. The primary difference being that today, that “word of mouth” is digital, taking place across social media platforms, email, and chat groups at a drastically accelerated pace. As members of these new online communities, employees have the potential to be powerful advocates. And when that power is properly harnessed, the positive effects of employee advocacy can be impressive. —Your employees are connected to 10x more people than your brand. Which means when they share content, brand awareness sky-rockets. —33% of customers trust brands, while 90% of customers trust recommendations from people they know. It’s true—employees make the best brand ambassadors. It only makes sense to channel their enthusiasm for the brand. —Content shared by employees receives 8x more engagement than content shared by brand channels. That means 8x as many likes, shares, and comments. —Just 1 person who shares your message can result in more click-through activity than if your company adds 100 followers. There’s a tremendous amount of potential in every single employee. —60 employees can increase your company’s reach by 1,000%. All it takes is a good communications strategy, the right platform, and a little engagement. —79% of firms reported more online visibility once implementing a formal employee advocacy program. These employee advocacy facts speak for themselves—an employee advocacy program is an extremely powerful tool! This can add a real boost when it comes to engagement and the production of user generated content. Make sure your platform offers polls, quizzes, and rewards as a means of encouraging employees to speak their mind and get involved. This will jumpstart engagement early in the program. Measurement is important. In order to know if your employee advocacy program is working, it’s essential that your platform has the capability to track data. Ideally via a leaderboard, on things like the number of shares, likes, and user generated content created. The ability to send out automated newsletters can be a big plus. If it comes with attractive templates, even better. Because newsletters are still a powerful tool, they just have to be adapted to the digital age. And targeting features can enhance newsletters even further. Automatic content curation is another feature that the best platforms will provide. Third-party content is important because it boosts engagement, and it gives employees the information they need to become thought leaders themselves. A good content mix simply keeps things interesting, too. Perhaps the most important factor in forming your employee advocacy strategy and selecting a platform is mobile capability. The fact is, mobile devices are the conduit most often used by employees to engage with their social media apps. True, they will still use desktops to a degree. But now more than ever, a mobile-native experience is crucial when it comes to employee advocacy. Your platform needs to be easy to use, visually appealing, and intuitive as a communications tool. If it’s clunky to use, then employees simply will not engage. Give them a sleek, intuitive, mobile alternative. Before going full-on, a pilot is often a good idea. This will help you work out the bugs and find solutions before the full roll-out. When launching an employee advocacy program, the people you select for a pilot can have a defining impact on the success of the initiative. But how you choose your pilot participants also depends on the ultimate objectives of your employee advocacy initiative. Whether your priority is to drive adoption among a specific department, or to pave the way for a global deployment, here are the best ways to define who should be involved in your employee advocacy pilot. A pilot doesn’t necessarily need to include everyone at a company, but your odds of it being a success are higher with a larger sample size. A large pilot is more likely to get support from top management, and the results will be more visible to make a case for the full roll-out. For a larger company, this might mean an initial pilot that involves hundreds or even thousands of employees. Yes, this means a bigger project. But it also means that your efforts are less likely to fizzle out or go unnoticed. Just make sure company leaders are on board. Their support is crucial for building employee advocacy. A good place to start when selecting participants is with those who already advocate for you on social media. Those who engage with company content on a regular basis. Including those who are already connected with clients online, or who share their own work-related content. 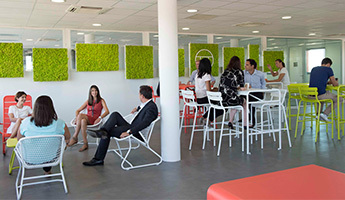 This may include photos taken at company events, for example. By doing this you bet on the people who are most likely to engage on an employee advocacy platform. They also set the tone for others and even play a leadership role in subsequent training and onboarding initiatives. 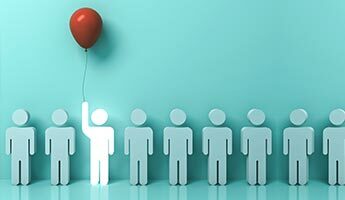 Another way to address an employee advocacy pilot is to select those people who fall into your target user group. Contrary to the first option, this may include people who don’t often use social media in a professional context. If you are launching an employee advocacy platform to encourage social selling, the pilot should hone in on sales teams. It may also require dedicated training. Alternatively, if the primary objective of your employee advocacy program is to drive recruitment and develop your employer brand on social media, the pilot should be for HR teams. Think about relevance as it pertains to your goals. Selecting employee advocacy pilot participants based on location is also an option. Focusing on an initial country or region allows you to identify the combination of needs to address ahead of a large-scale deployment. These include the configuration of global and region-specific channels, the assignment of regional project leaders and platform administrators, and the combination of company-wide and region-specific gamification initiatives. Location can indeed make a difference. 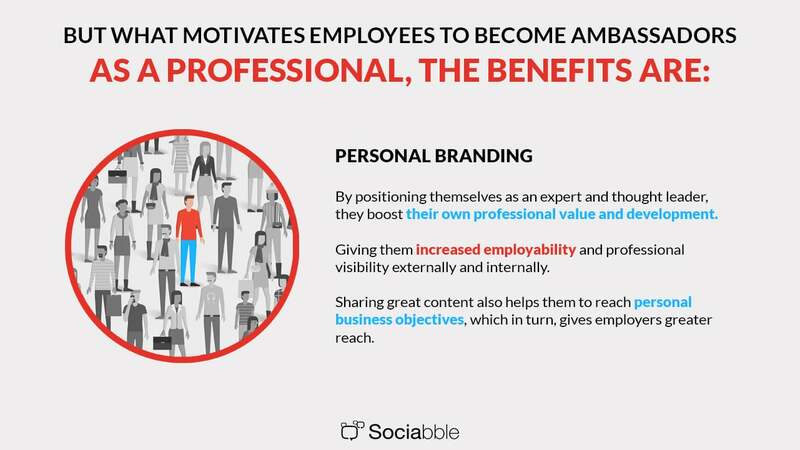 It pays to take this into consideration, and incorporate it into your employee advocacy ideas. Employee advocacy allows companies to expand their marketing team by engaging all employees in social media communication. Content shared by an individual is more trusted than that coming from official brand channels. On their own networks, employee advocates share company posts, user-generated content, and third-party content that is relevant to their industry. This content is viewed by audiences that are far more receptive and trusting to what is being shared, rather than content coming from brand channels. Furthermore, the reach of employees is often far greater than that of company pages alone. However, employee advocacy is about much more than having employees follow company social network accounts and simply share what is given to them. 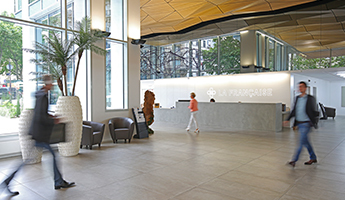 It involves establishing organizational roles, educating employees about best practices and personal branding. This creates engagement incentives and, of course, helps in defining and tracking both qualitative and quantitative KPIs. When launching an employee advocacy initiative one thing needs to be decided before anything else. Who will steer the project? Whatever your company’s advocacy engagement strategy is, assigning organizational roles is necessary in order to streamline communication. Similarly, they need to balance task management and ensure the longevity of the employee advocacy initiative. Having organization in place from the get-go allows for a clear vision and a successful program. You need to address certain questions when implementing an employee advocacy initiative. What are the ground rules for communication? What type of content and/or language should we avoid? How will any bad buzz be managed? How do employees know what they can and cannot share? Covering questions such as these, as well as others, can be done in training sessions. Which one could do on both formal and informal levels. This way you can tailor information to individual departments and address all concerns. It is important to remember that if your employees do not feel secure in their understanding of how your program works and its benefits, they will fail to engage. Implementing regular check-ins and updated training sessions allow your employees to grow and feel comfortable in their role. A successful employee advocacy program has benefits that extend beyond simply raising brand awareness and brand advocacy. It can easily dovetail into larger, more expansive employee communications initiatives. With this in mind, consider the big picture. You are improving the way employees share information. You’re also encouraging the creation of content and employee feedback. Don’t be afraid to think of your employee advocacy initiative as a crucial part of your company’s larger internal communication and employee communication programs. Communications should be integrated. There’s no reason to compartmentalize one arena of communication within your office. And when choosing a platform, find a solution that can handle both. Your employee advocacy tools can usually do more than you think. And companies that use employee advocacy can often do more with it than they realize. The results from a well-planned employee advocacy program won’t come overnight. It will take some time to plan and to educate employees. To launch and to yield results. After all, you’re not just changing your strategy. You’re going to be changing the way employees think and share regarding their company. But results will come, in both tangible and intangible forms. Patience, planning, and dedication make the difference. They will help you unlock the full power of employee advocacy. 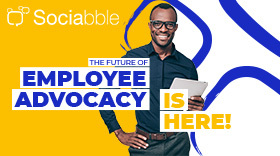 If you’re looking for a specific platform to launch your own employee advocacy initiative, Sociabble offers a full-service employee advocacy platform, complete with total social media integration and CSM support. It allows you to aggregate both company and employee-generated content, organize it into interest-based channels, and make it sharable on virtually any social media outlet with a single click. It helps employees enhance their digital footprint, while simultaneously giving companies more external visibility and awareness. 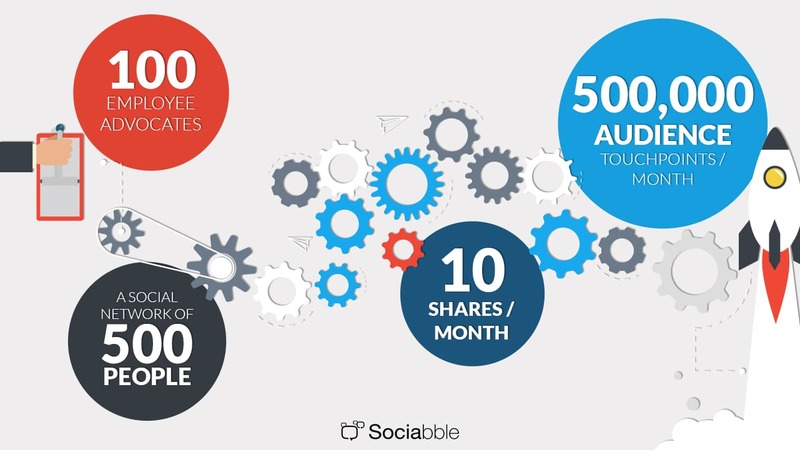 If you’d like to see Sociabble in action, you can book a free demo here. We’re happy to discuss ways we can help, explain more fully the new employee advocacy definition, and even provide strong employee advocacy examples.